Just throwing this out there for anybody like me that didn't know how to test a starter/generator. This is how I tested mine and there may be other ways to do it, but this ended up being pretty simple. 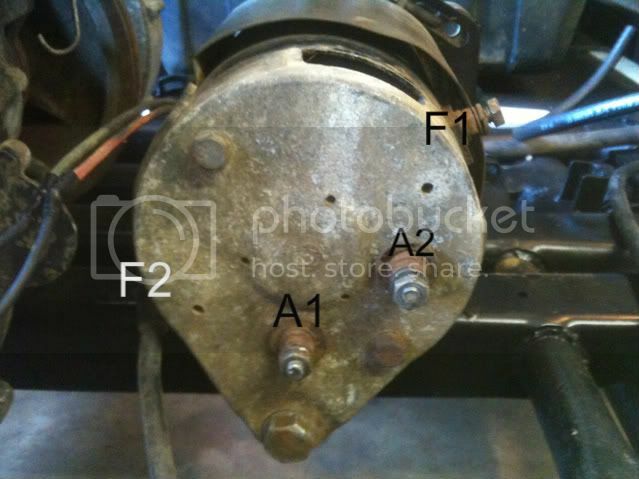 First off there are 4 posts on the starter each should be stamped A1, A2, F1 and F2 as in the diagram above. There should also be a green wire and a red wire coming out the side of the starter. I disconnected all cables and wires prior to testing. Connect post F2 to the positive terminal on your carts battery and A1 to the negative terminal. Now if you connect A2 directly to F1 your starter should spin forward. For reverse connect F2 to positive terminal of battery and A2 to the negative terminal. Now if you connect A1 directly to F1 the starter should run in reverse. The last thing I did was check the Ohms running through the red and green wires. To do this use a voltmeter set to Ohms (looks like an upside down horseshoe symbol) touching the green wire with one probe and the red wire with the other you should read about 5 Ohms. Hopefully this will save you some time if you were wondering if your starter was bad. Took me a while to figure out on my own without a repair manual. how can you tell if its charging the battery? thanks this was really useful to get my cart running. put a volt meter on the battery. Rev up your cart to full speed. You should see voltage above 12.5 DC volts. Even as high as 17 volts. Sticky this thread. This is great information. Nice to give back to the forum that helped me rebuild my cart. Now I have a g9 and did this same test but mine ran opposite of what yours did hooked up the way you explained. Would this mean mine is bad?